George Petrelli's Steak House AKA George Petrelli's Famous Steaks, a Culver City institution, seemed like just the remedy for a dull Sunday night...a high-end burger. George Petrelli's Steak House's reviews were all over the place, but I had high hopes for the steak house burger. Wolfgang's Steakhouse and Billingsly's (both steak houses) delivered in terms of value and quality. Free parking was in grand abundance thanks to the attached lot of the stand alone restaurant. When approaching, I noted the wonderful smell of meat smoke. Here's a little from the George Petrelli's Famous Steaks website: "...George Petrelli was introduced into the restaurant business in 1956 by his Uncle Joe Petrelli, who trained George in every aspect of the business. George specialized in the meat department since his Uncle Joe stressed that Petrelli's customers would be served only the highest quality of meat. George is proud to have carried on the tradition of serving the best in fine quality food while maintaining reasonable family prices. Although Petrelli's Steakhouse has earned its reputation for its steaks, their menu has a varied selection of chicken, seafood and pasta entrees as well. Even though meat has been their trademark, their Eggplant Parmigiana and Baked Lamb Shank have received rave reviews -- and don't forget about those fabulous burgers!..." It took about 15 minutes for the Cheeseburgers to arrive. While waiting, I had occasion to speak with the hostess who informed me that Hughes Aircraft held their annual Christmas party at George Petrelli's. The high-demand item on that menu was the burger. The Beef: The beef in the 8-ounce, 20% fat cheeseburger was outstanding. The $10.50 burger was composed of equal parts Filet and Sirloin. The Filet created a sumptuous mouth feel with it's tender texture. The Sirloin contributed beefiness, iron, a firm texture, and enough graininess to remind us that we were masticating steak. There was just enough dry-aging funk to remind us that we were at a legitimate steak house, but not so much as to put off Happy Meal. The fat was just enough to coat our lips as we bit into the burgers...not our fingers....win! 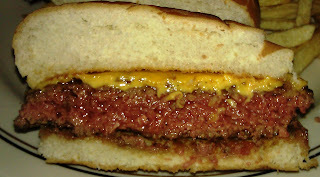 The burger meat in the big, irregular patties was perfectly juicy. The beef was excellent, and the quality of the ingredients was highly evident. 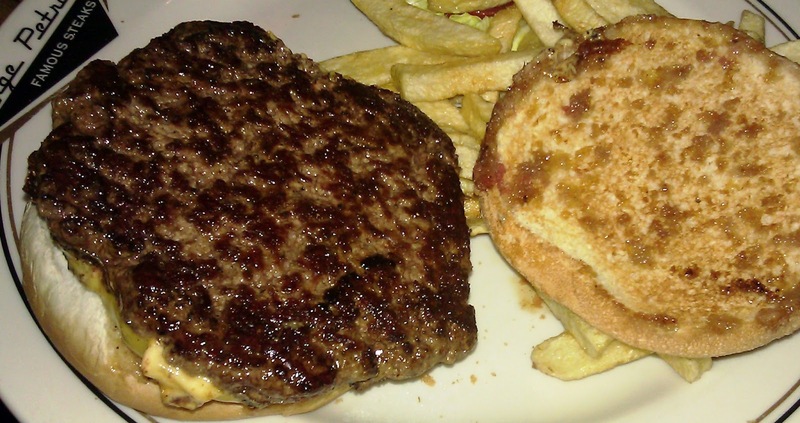 The Seasoning: I noted a light dusting of salt on the exterior of the juicy, thick burger patty. The Sear: The sear was good but not great. This was the only shortcoming of the cheeseburger at George Petrelli's Steak House. Granted, I ordered by burger Med-Rare, and the kitchen delivered a perfect and bloody Med-Rare. The sear was not quite thick or crisp enough to achieve burger perfection, but the sear was better than most. Considering the very high bar set by the beef, I really wanted the sear to be amazing. When I return, I will ask the kitchen to make an adjustment to deliver a killer sear. I pledged to return, because finding a great burger in Culver City, CA had been a bit like tilting at windmills with the standouts being Smashburger and Five Guys. The Preparation: The beef was aged and trimmed on-site. The burger meat was freshly ground on-site. The large, thick, flat patties were hand-formed during the morning prep cycle. The patties were formed with great care, and this came accross in the tenderness of the bite. The burgers were cooked to a perfect and bloody Med-Rare on a gas-fired flat-top (griddle). The preparation was exactly what one would expect of a steak house with an 82-year history. The Cheese: There were a couple of cheese choices at George Petrelli's Steak House. I went with American, because American cheese is a safe an consistent choice for a cheeseburger. The slices of American cheese were perfectly melted. The cheese fused gently with the tender ground beef and lent just enough umami and savory notes to round out the flavor of the burger. The Bun: The bun came courtesy of the newly revitalized Pioneer French Baking Company. This was a non-seeded, standard burger bun. The bun was fresh, a little sweet, tender, moist, and it compressed perfectly when bitten into. The bun was lightly toasted, so it provided little in terms of crunch. The Meat To Bun Ratio: Perfect. Each bite was a perfectly balanced mouthful of tendef tender beef and tender bun. The Toppings: The Iceberg lettuce and tomato slislice were both fresh and ripe. The Fries: Meh. The fries were not in the same class as the terrific burger. The fries not par-cooked, so they were slightly thicker versions of the styrofoam match sticks that one expects at In 'N Out. The fries were only moderately seasoned. The fries paled in comparison to the cheeseburger. 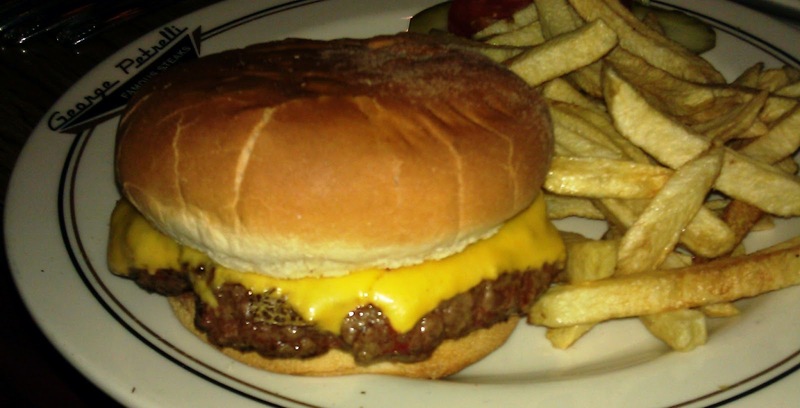 The Value: The The cheeseburger at George Petrelli's Steak House was $10.50. This was a very fair price considering the high quality of the ingredients and the flawless preparation. Happy Meal was unable to polish his off, and that boy is a bottomless pit. George Petrelli's Steak House should probably just change its name to George Petrelli's Excellent Cheeseburgers. The burgers were a hit with both myself and Happy Meal. 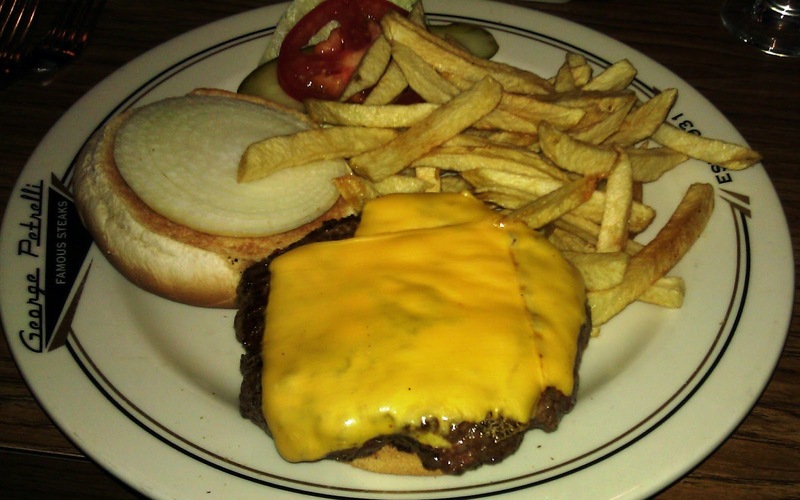 Quality ingredients and skilled preparation made for a wonderful, flavorful, juicy cheeseburgers. Burger Review : Finally, I have found a really, really good cheeseburger in Culver City, CA. 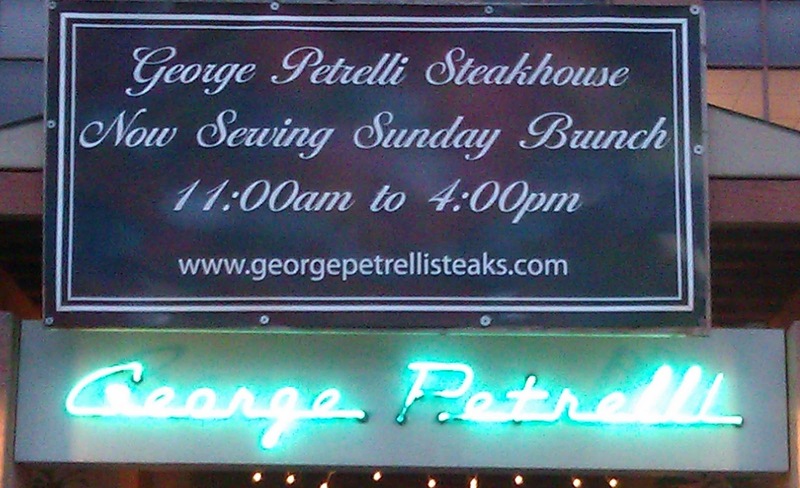 Go to George Petrelli's Steak House, and go there often. And yes, the fries do indeed look as lame as you describe. I usually order chips when available, since they're less filling and more consistent from place to place. This looks like a good, honest burger. I guess pictures can be deceptive, because the sear looks highly successful. Though a picture can't really give a sense of sear depth. It would be interesting if, for your reviews, you'd take a brave bite of the onions, and give your take on them like you do the other condiments. Pete: "When I return, I will ask the kitchen to make an adjustment to deliver a killer sear." Though I have no doubt you WILL ask such a thing :) I wonder, exactly what adjustment you'd suggest to them? The sear wasn't crisp, and it wasn't deep enough to lend any resistance or crunch. Onions---yuck--I just do not like them raw. I would ask the kitchen to place the burger on the absolute hottest part of the grill with just a little butter or grape seed oil. I would ask them to only turn the patty once. I had a similar issue at Wolfgang's Steakhouse once before, and they obliged my request.